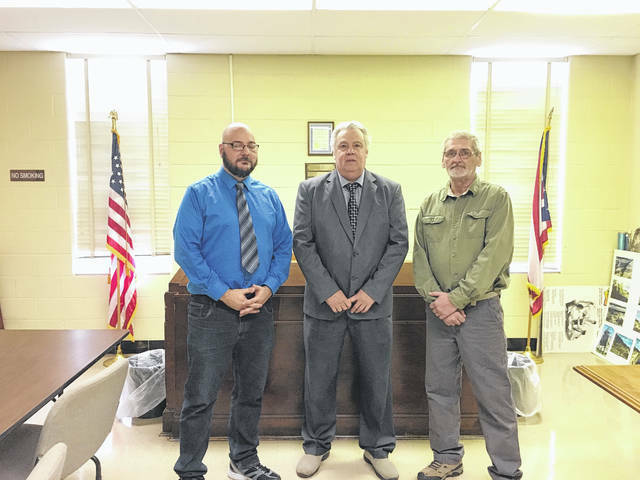 New Boston Mayor, Junior Williams(middle) along with the two new council members, Ryan Ottney(L) and John Whisman (R). Recently, New Boston Village Council held their organizational meeting for 2018. The purpose of the meeting was for newly elected Council members Johnny Whisman and Ryan Ottney to speak their oath of office, then Council appointed a President Pro Tem for the current year and established the council meeting time and place for 2018. Mr. Whisman and Mr. Ottney begins their elected four-year term, succeeding former members Vonald Patrick and Ralph Imes. Mayor Williams and councilmembers thanked Mr. Patrick and Mr. Imes for the service to our community. The next scheduled New Boston Village council meeting will be held on Tuesday, January 16. The public is invited to attend. https://www.portsmouth-dailytimes.com/wp-content/uploads/sites/28/2018/01/web1_NEW-BOSTON-mayor-ottney-whisman-1-1-1.jpegNew Boston Mayor, Junior Williams(middle) along with the two new council members, Ryan Ottney(L) and John Whisman (R).